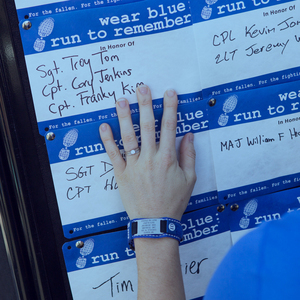 A national movement, “wear blue: run to remember” honors the fallen through organized runs all across the nation. President and co-founder Lisa Hallett needed a way to process her grief after her husband, Capt. John Hallett, and other members of the Army’s 1st Battalion, 17th Infantry Regiment, were killed by a roadside bomb in Afghanistan in 2009. Surviving the loss of her husband, best friend, and father of her three young children, Lisa turned to running. An avid runner, she soon found a community that needed the same kind of support that running gave her. The wear blue movement has blossomed into a robust national movement that organizes runs all over the country. At the start of wear blue runs, the name of each U.S. military member killed on that weekend over the last 13 years of war is called out in a Circle of Remembrance. wear blue runners call out the names of those for whom they personally run: their husbands, wives, parents, siblings, battle buddies, neighbors and/or friends. wear blue: run to remember officially participates in major national races, including the Rock ‘n’ Roll Marathon series, the Army Ten Miler, and the Marine Corps Marathon.At official wear blue events, hand-held American flags line the course to honor the fallen, a tribute called the wear blue mile. wear blue: run to remember is a national nonprofit running community that honors the service and sacrifice of the American military. It creates a support network for military members and their families, bridges the gap between military and civilian communities, and creates a living memorial for our country’s fallen military members. The organization exists for the fallen, for the fighting and for the families.